"The ease of installation is great. Just put loops over bow and stern, put lasso under or around car top bars and snap together. Quick and secure." "Thanks to my Lasso kayak lock, my new kayak spent the entire summer out and ready for rides down at the lake. It was obvious that someone had attempted to undo the lock, but thanks to the strength of the Lasso, they couldn't steel my kayak. I feel good knowing my kayak is safe with your lock and have recommended your product to many friends-- who now also feel as safe as I do keeping their kayaks down by the lake". "I just received two of your Lasso Locks. It is really great to be able to order and receive such a quality item as you are producing. Thank you so much. "Quite an ingenious setup ... the perfect solution to locking my Recluse, which has no U-Bolt or cheekplates to attach a regular cable lock to. It also is very visible, which may act as a deterrent ... And the best part is that it will work on all sea kayaks. I'd give it a 9 out of 10 rating." "Thanks you guys for making it easy. Finally, a product that works for keeping my boat safe!" "While traveling, Lasso lets me make all the stops I want without worrying about my boats getting ripped off. " "I like the coating on the cable and the locking system." "Quality Design and workmanship. 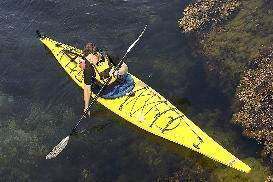 It stands out and even makes my kayak look better! " "It's fast and easy to install. It's pleasing to the eye and it provides a way to keep my kayak safe. "Secure and easy to use. Our kayaks are suspended from the rafters in a carport. The cable end is run through a hole in the rafter before locking to prevent the boats from leaving with out me." "I like the bag to store the lock in my vehicle." "High quality cables are great and the entire system is easy to use. Cheaper than a new boat! " "The ease of installation. Just put loops over bow and stern, put lasso under or around car top bars and snap together. Quick and secure." "Ease of use, adopts to any size boat." "I like that the lock is part of the cable, less pieces, easy to stow." "Able to lock singles, unable to cut with bolt cutters." "Ease of use, durable, peace of mind." "Keeps my boat safe while traveling." "What do I like most? Knowing that I can leave my kayak on my vehicle and that it most likely will still be there when I return." Whether you're hiking, camping, staying in a motel, grabbing a bite to eat, or just need to leave your kayak parked on top or your vehicle for a while, it's important to consider that it only takes a thief about 30 seconds to cut your straps and make off with your kayak. One unfortunate reality is, if a thief wants to steal something, they will find a way. Having said that, I believe that most thieves are inherently lazy; that’s why they’re thieves. So any deterrent you can present is going to go a long way to making sure you still have a kayak the next time you need an adventure or want to go for a paddle. Lasso kayak locks are a highly visible and effective theft deterrent that will send would be thieves looking for an easier target. We at Lasso sincerely hope you never experiance the loss of your Kayak. We appreciate hearing from you. Send us a simple e-mail and tell us what you like about your Lasso Security Cable. Your fellow kayakers will enjoy your feedback.